From the Studio that brought you the #1 Super Hero movie of all time, Marvel’s The Avengers, comes another must-own, epic blockbuster starring Chris Hemsworth as The Mighty Thor. Worlds collide when a powerful ancient enemy threatens to plunge the cosmos into eternal darkness. 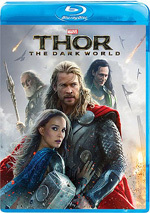 Now, reunited with Jane Foster (Natalie Portman), and forced to forge an alliance with his treacherous brother Loki (Tom Hiddleston), Thor embarks on a perilous personal quest to save both Earth and Asgard from destruction. Experience this action-packed adventure featuring exclusive bonus content, including a Gag Reel, deleted scenes and a new Marvel short film available only on Blu-Ray. $85.737 million on 3841 screens. If it existed on its own, I don’t know if 2011’s Thor would have inspired a sequel. Actually, it probably would have, as it did pretty good business, but I’m not convinced that it would’ve turned into a potential franchise without its connection to 2012’s Avengers. That movie’s remarkable $623 million take in the US added luster to all the characters attached to it, and I suspect that helped make 2013’s Thor: The Dark World a bigger success than it otherwise might have been, as the sequel outgrossed its predecessor. Millennia ago, Dark Elf leader Malekith (Christopher Eccleston) attempts to send the universe into eternal darkness. Asgardian warriors stop him and think they eliminated the Dark Elves. Nope. As it happens, Malekith and some accomplices went into suspended animation, and with a convergence of the Nine Worlds at hand, they snap out of this state. Malekith attempts to recapture a powerful force called the Aether and use it to finally accomplish his goals. In present-day London, scientist Jane Foster (Natalie Portman) happens upon the Aether and becomes “infected” by it. Her old Asgardian god beau Thor (Chris Hemsworth) comes to rescue/protect her while he and his cohorts try to stop Malekith. This leads to a risky alliance with Thor’s devious brother Loki (Tom Hiddleston). As I mentioned when I reviewed the 2011 Thor, I never felt a great positive attachment to the franchise. Indeed, of the four Avengers who got their own solo movies – Thor, Hulk, Captain America, Iron Man – I always liked Thor the least, and by a pretty sizable margin. That doesn’t mean I took no enjoyment from the comics, but its sort of mythology never did much for me, so I was a lukewarm Thor fan at best. This meant that even though I thought Thor offered a moderately pleasant surprise, I still didn’t go into Dark World with much enthusiasm. Nothing that occurred as I watched it did much to change that attitude; I went into the movie without a lot of excitement and I left it the same way. Not that this means I disliked it, because that wouldn’t be true. However, I also can’t claim that I thought too highly of it. Dark World delivered a bit of fun and adventure but did little to impress me in any particular way. Part of the problem stems from the story itself. I boiled down my synopsis to the bare bones; like most superhero movies, the narrative proves to be much more complicated than necessary, so I left out a lot of details I felt were extraneous. Essentially the Dark Elves want to turn everything into darkness so Thor and company try to stop them – end of plot. There’s nothing wrong with that basic tale, of course, but the way the movie tells it leaves something to be desired, partially because of the villain. Malekith provides a relentlessly bland baddie. We don’t care about his quest and we don’t care much about him. He just seems to exist because the movie’s supposed to have a primary bad guy, but he never turns into a vaguely intriguing personality; he must be one of the least interesting superhero villains I’ve seen. It probably doesn’t help that none of the other characters get arcs comparable to what we saw in the first film. Some of that seems inevitable; Thor needed to introduce all the roles, so they clearly had more room for growth than they’d encounter in a second chapter. Nonetheless, the various characters seem awfully “stuck” here. For the most part, Thor and Jane lose the loose charm they had in the prior film. We still like them well enough, but they don’t develop in any particular ways, and they come perilously close to “plot device” territory. That’s largely true for the others as well – would Jane’s assistant Darcy (Kat Dennings) exist if not for comic relief? – and the different parts threaten to become stagnant. I will say Hiddleston continues to do nicely as Loki, and alone among the main roles, he gets a chance to grow. I won’t say much about that side of things lest I enter spoiler territory, but even in his third film, Loki comes with new twists, and Hiddleston makes the most of these opportunities. Dark World also tends to drag at times. Its attempts to mix comedy, drama and action don’t work well, as it jumps from serious scenes to lighter ones and back again without smoothness. This tends to undercut the humor, as the gags feel forced, and also hurts the more serious moments, as they don’t get room to breathe. Does all of this make Dark World a dud? No – for all its flaws, it still usually keeps us with it. Hemsworth may not get much room for character growth, but he still creates a convincing lead, and the others do just fine as well – at least within the parameters of their underwritten roles. And the action seems pretty good. The second act seems a bit flat, but the film opens with some exciting pieces, and it builds to a fairly fun climax that manages to pack in some fresh elements. Even with a mix of convoluted components, the flick finishes on a positive note. It’s too bad Dark World can’t maintain more consistency across its entire running time. I don’t want to be too critical of the film, as it does deliver a competent, occasionally peppy superhero adventure. It just seems rather lackluster a lot of the time, however, and doesn’t do as much to engage the viewer as I’d expect. Footnote 1: As usual, Dark World comes with bonus segments during – and after – its end credits. Footnote 2: I might be alone, but I think Thor should go after Sif, not Jane. She’s a better match in terms of personality, and she’s hotter! Portman’s pretty but I think Jaimie Alexander is much sexier. Heck, I’d think Thor should pursue Darcy instead, as she’s also more attractive than Jane, though I can understand that her flaky personality might get on the Thunder God’s nerves. 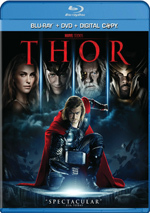 Thor: The Dark World appears in an aspect ratio of approximately 2.40:1 on this Blu-ray Disc. While I thought much of the film looked great, a few elements seemed a bit lackluster. As one might expect from a flick like this, Dark World provided a stylized palette. Colors tended toward a golden tint, though they weren’t overwhelming in their orientation, and other scenes leaned in different directions. Overall, the hues appeared well-rendered and distinctive. No inconsistencies affected the excellent DTS-HD MA 7.1 soundtrack of Dark World. With a variety of action and ambient elements, the audio brought the events to life in fine fashion. Fight sequences added the greatest punch, and the pieces used all the speakers to great advantage. Quieter scenes contributed good breadth and smoothness as well. All of this meant the audio filled out the spectrum in a nice manner. The disc comes with a reasonable roster of extras, and we open with an audio commentary from director Alan Taylor, producer Kevin Feige, cinematographer Kramer Morgenthau and actor Tom Hiddleston. This edited piece combines two separate running, screen-specific chats; Taylor/Morgenthau pair for one and Feige/Hiddleston sit for the other. The track looks at story/character areas, cast and performances, sets, locations and visual design, music and costumes, camerawork, effects, stunts and some other domains. Of the two pairs, Feige/Hiddleston dominate the commentary. That comes as a surprise, as one might expect the director to give us the most information, but it’s not a problem. Even with the Feige/Hiddleston part in the majority, we still get decent balance and learn a fair amount about the movie. The commentary covers the movie well. Continuing a series of short adventures, Marvel One-Shot: All Hail the King runs 13 minutes, 51 seconds. It gives us a follow-up on the Mandarin character (Ben Kingsley) from Iron Man 3, as he meets with journalist Jackson Norris (Scoot McNairy). It’s always a delight to see Kingsley in the role, and the short provides an intriguing tale that I’m sure will develop more in the future. Oh, and stick around through the credits for a hilarious cameo. A two-part documentary called A Brother’s Journey: Thor and Loki fills a total of 31 minutes, 39 seconds. 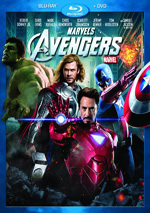 We find comments from Taylor, Feige, Hiddleston, executive producers Craig Kyle, Louis D’Esposito, and Victoria Alonso, Avengers director Joss Whedon, special makeup effects designer David White, stunt coordinator Steve Dent, visual effects supervisor Jake Morrison, production designer Charles Wood, and actors Natalie Portman, Chris Hemsworth, Kat Dennings, Jaimie Alexander, Zachary Levi, Ray Stevenson, Stellan Skarsgaard, and Christopher Eccleston. 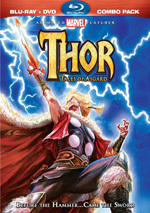 As implied by the title, “Journey” focuses on the Thor and Loki roles, though it broadens to other areas as well. We learn about character specifics as well as casting/performances, sets and locations, costumes, various effects, stunts and action, and a few additional topics. “Journey” provides a decent overview of the film, though it lacks much depth. It spends too much time with basic discussion of characters/story, as these don’t expand our understanding of the film in a substantial manner. The documentary has its moments but seems pretty average. For a preview, we go to an Exclusive Look at Captain America: The Winter Soldier. In this three-minute, 35-second piece, we get notes from Feige, directors Anthony and Joe Russo, stunt coordinator Thomas Harper and actors Chris Evans, Samuel L. Jackson, Sebastian Stan, Anthony Mackie, Scarlett Johansson and Robert Redford. They tell us a little about story/characters as well as stunts. Despite the smattering of movie facts, this remains a promo piece. Another featurette arrives via the five-minute, 21-second Scoring Thor: The Dark World With Brian Tyler. We hear from composer Tyler as he discusses his work for the film. Despite the program’s brevity, it offers good insights into the film’s music. Six Deleted and Extended Scenes occupy a total of seven minutes, 49 seconds. These present “Extended Celebration Scene”, “Jane Learns About the Aether”, “Loki: The First Avenger”, “Thor and Frigga Discuss Loki”, “Dark Elves Prepare for Battle” and “Extended Vanaheim Scene”. For the most part, these seem inconsequential. “Frigga” allows the eternally underused Rene Russo a little more screen time, but the rest seem inessential – and “Avenger” offers the same scene found in the final flick with a different actor for one short segment. We finish with a Gag Reel. It takes up three minutes, 30 seconds and displays a pretty standard compilation of silliness and mistakes. Nothing unusually interesting occurs. The disc opens with ads for Captain America: The Winter Soldier and various Marvel DVDs/BDs. Sneak Peeks also includes promos for Avengers Assemble, Ultimate Spider-Man, Need for Speed and Hulk and the Agents of SMASH. No trailer for Dark World pops up here. With Thor: The Dark World, we get a serviceable sequel, but it doesn’t do a lot to stand out as memorable. Though the movie offers reasonable excitement at times, it tends to drag and becomes one of the less interesting of the Avengers-related efforts. The Blu-ray comes with generally positive picture, terrific audio and a mostly useful set of supplements. Dark World works well enough to satisfy Thor fans, but I don’t think it will expand those ranks.